January 24, 1931: “The Gumm Sisters” (Judy and her sisters) performed as part of the “Meglin Kiddies’ group at the Pantages Theater in Los Angeles, California. The main attraction was the Ruth Chatterton film The Right To Love. 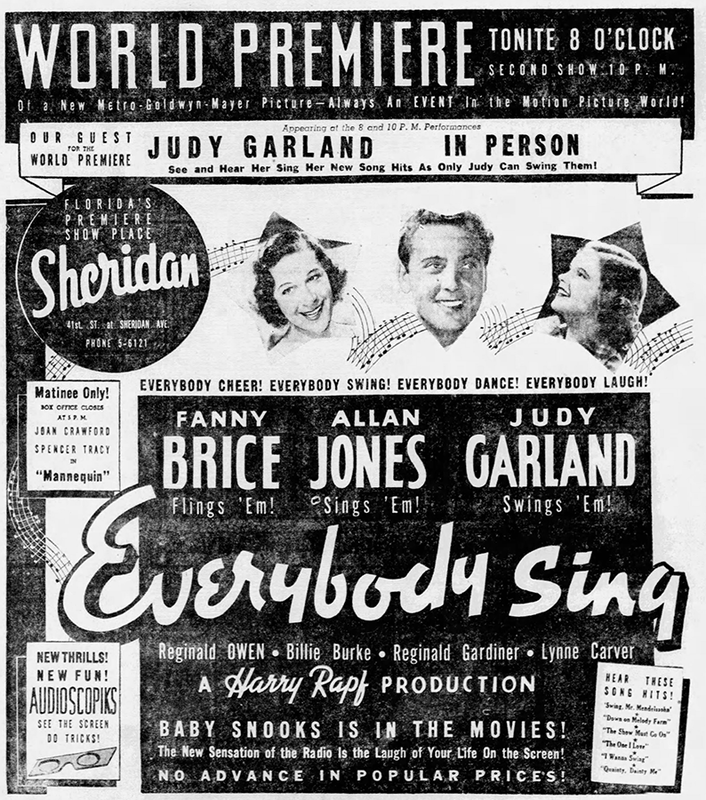 January 24, 1938: The world premiere of Everybody Sing took place in Miami, Florida. 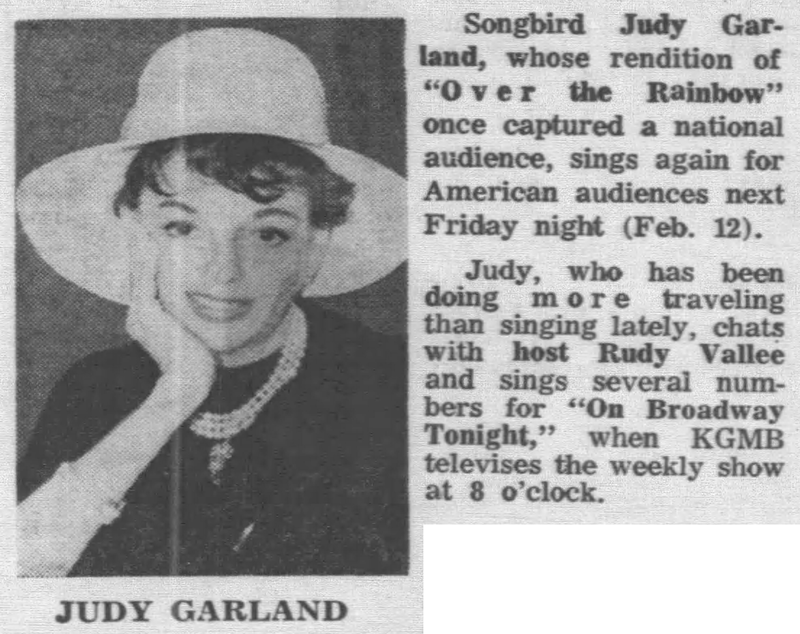 Judy arrived in Miami via train from Hollywood, California at 4:30 p.m. Immediately upon arrival in Miami, Judy was interviewed for WIOD Radio by Eddie Cohen of “The Miami Daily News” which was broadcast live from the station at 4:45 p.m. 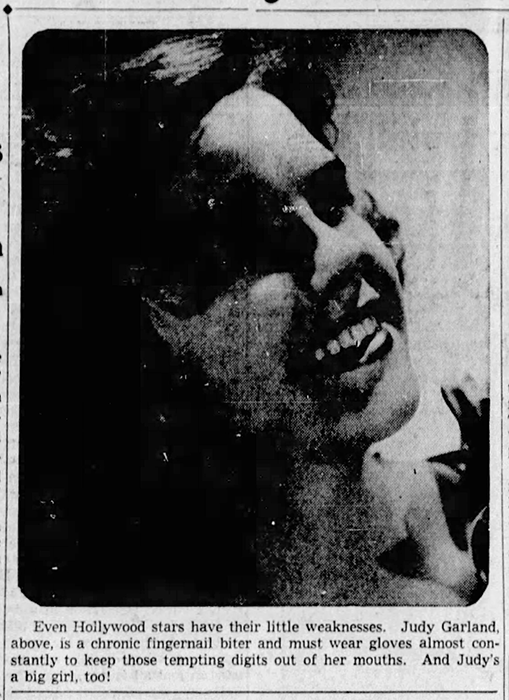 According to the article, Judy was scheduled to end the interview and leave the train station when the train of MGM executives arrived from New York, going to her room at the Roney Plaza Hotel to rest and prepare for her personal appearances at the theater showing the film, at 8:00 p.m. and 10:00 p.m.
January 24, 1940: Two newspaper filler items, one about Judy’s weakness for biting her fingernails, and the other about how Judy liked to wear a printed pinafore over her navy blue frock for school days. Next stop on the tour, the Jefferson Barracks fort outside of St. Louis, Missouri. 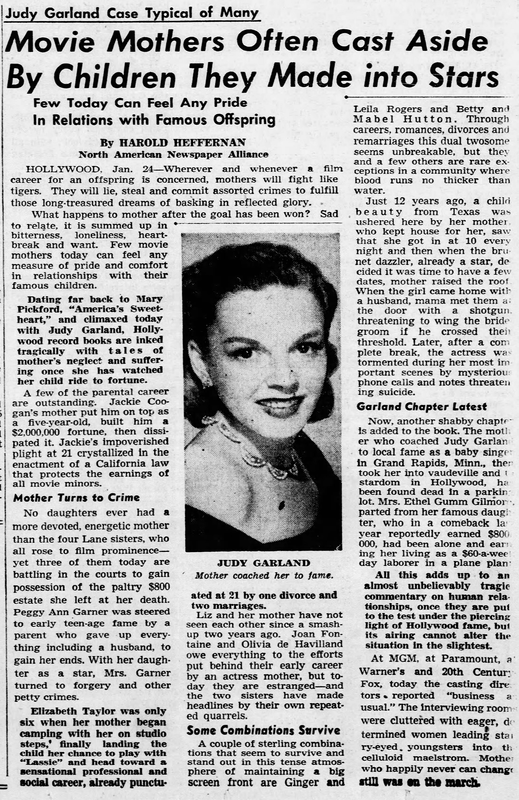 January 24, 1943: “Glamor’s Where You Find It” – written by Judy Garland (allegedly). 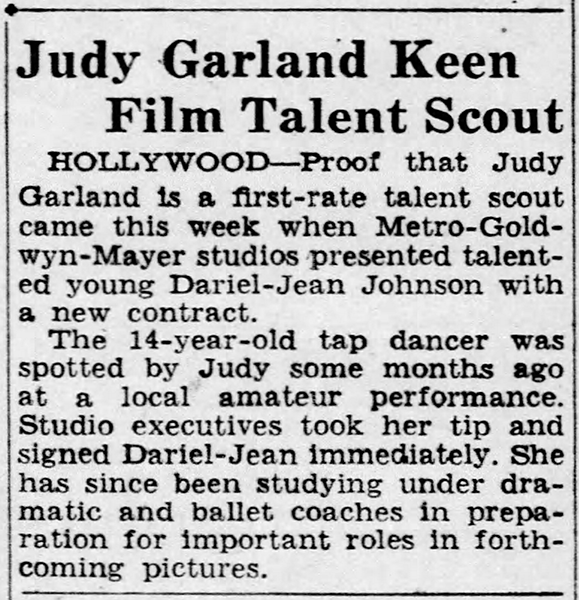 January 24, 1943: According to this article, Judy discovered a new talent for MGM, a young 14-year-old dancer named Dariel-Jean Johnson. If true, her career didn’t take off at all as I haven’t been able to find out anything more about the girl. 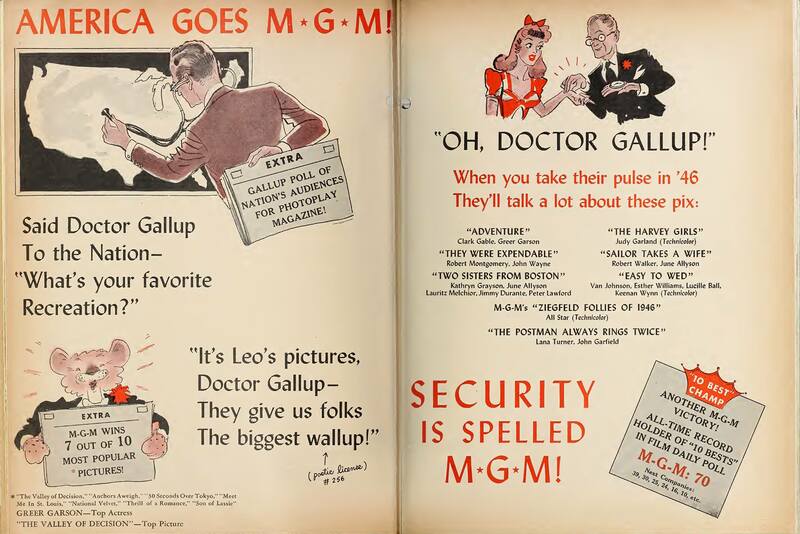 January 24, 1943: For Me And My Gal was still a big hit in various theaters around the country. 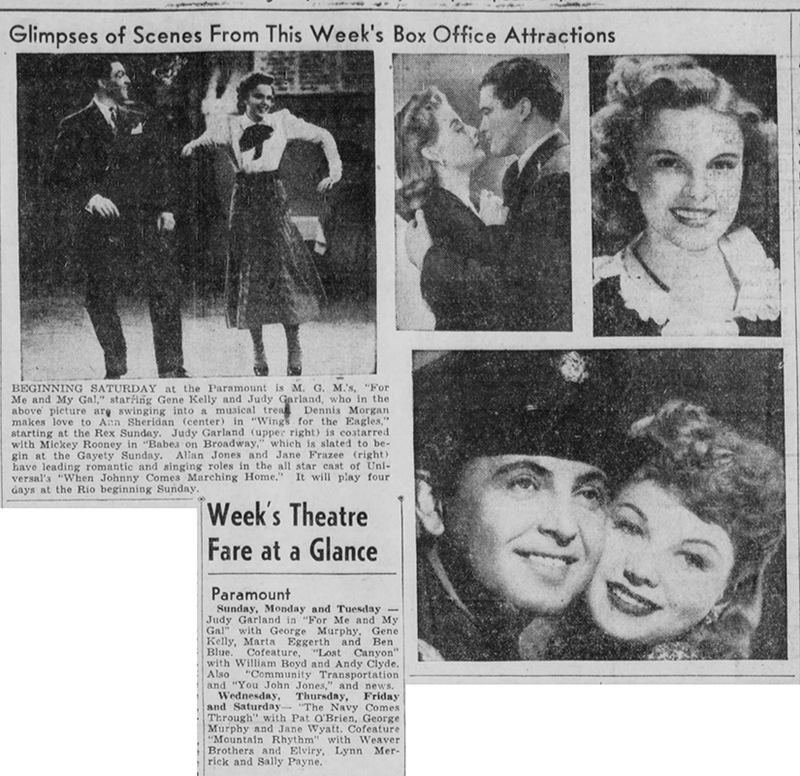 The first clipping is an article about Judy’s anecdotal issues rehearsing with Gene Kelly and losing weight, looking good, and then not being able to show off her new figure. Obviously cooked up by the always resourceful MGM Publicity Department. 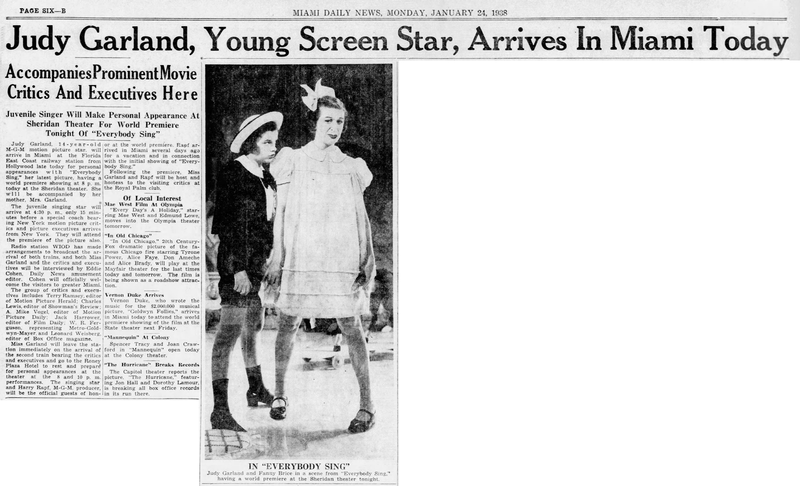 January 24, 1944: Judy and Tom Drake began two days of filming scenes on the “Exterior Site of Fairgrounds” set for Meet Me In St. Louis. Time called: 10 a.m.; arrived on set at 10:36 a.m.; dismissed: 5:35 p.m. These were the scenes that took place after the trolley ride and included the number “Boys And Girls Like You And Me.” All if was cut as it slowed down the film. No footage has survived, only these photos. 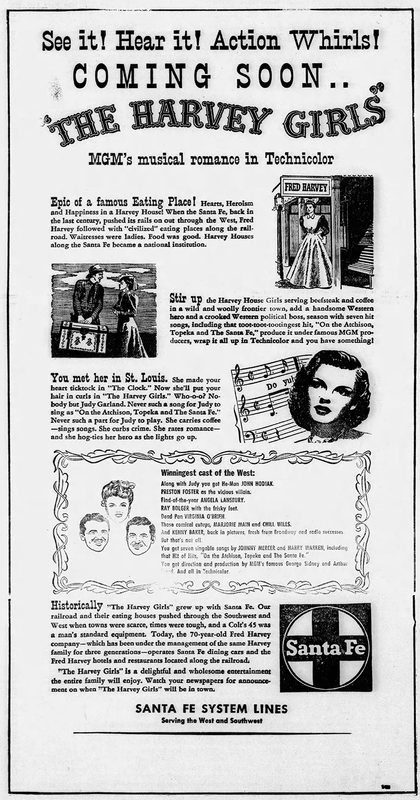 January 24, 1946: This ad appeared in the “Film Daily” trade paper. 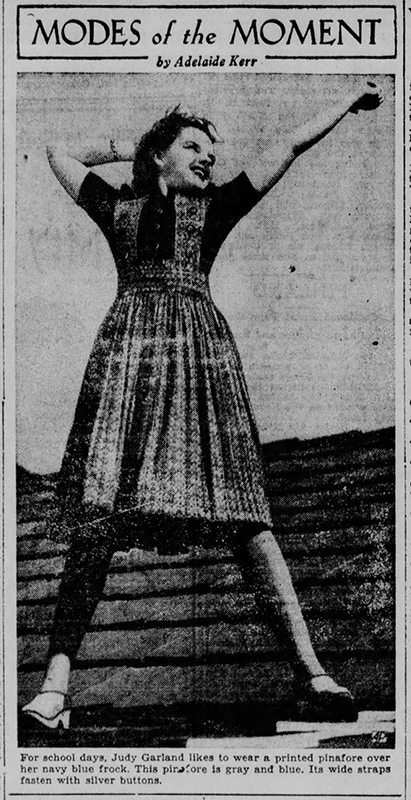 January 24, 1946: The Harvey Girls was a smash hit. 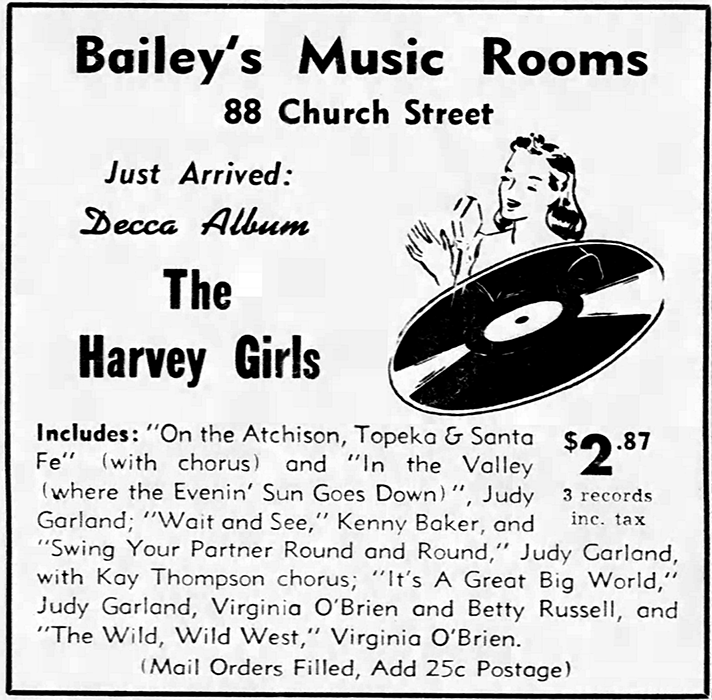 Here are some ads, including two for the “cast album” released by Decca Records, which was a hit on its own. 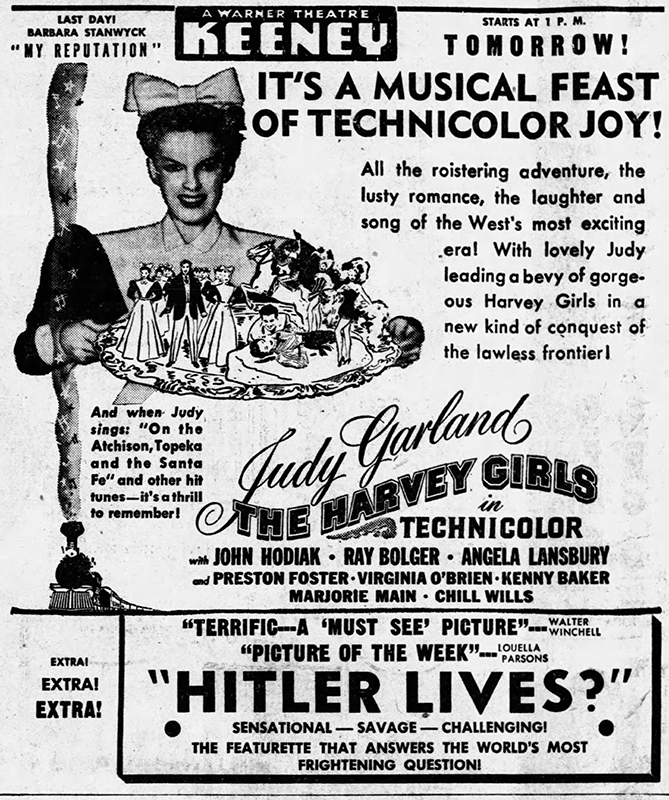 Check out The Judy Garland Online Discography’s The Harvey Girls Cast Album pages here. January 24, 1948: Judy arrived in makeup at MGM for Easter Parade at 7 a.m.; she was on the set at 9 a.m.; dismissed at 10:40 a.m. Filming for the day was canceled, per the assistant director’s reports: “Did not shoot on account of bad weather.” The plan was to continue shooting the “first Easter Parade” scene on MGM’s Backlot #2, the “New York Streets” section. 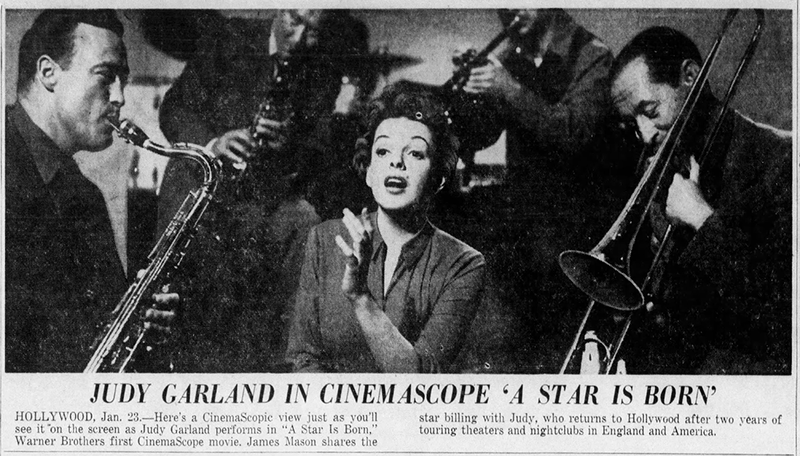 January 24, 1954: The captions for the two photos of the outtake version of “The Man That Got Away” are amusing in that they claim to be exactly what you would see in the film, in Cinemascope! 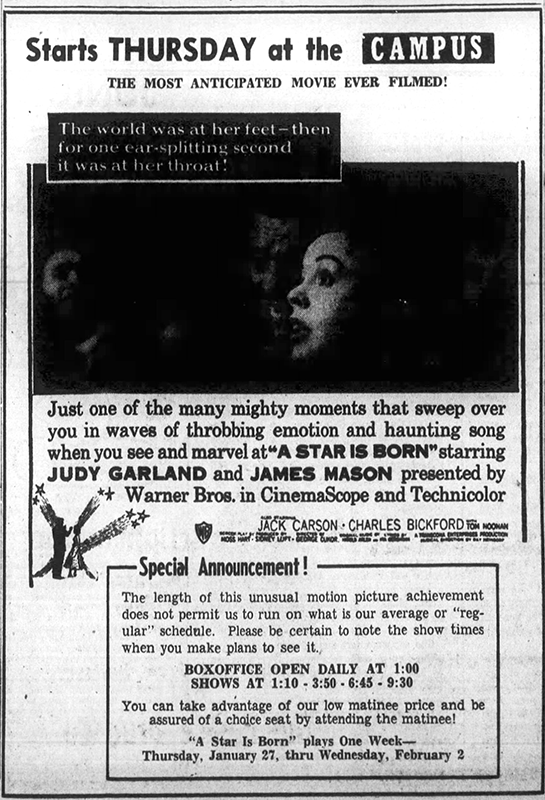 January 24, 1955: Even in its shortened form, A Star Is Born was proving to be popular which was probably helped by all of the Oscar buzz that Judy was receiving for her flawless performance. The above is a unique ad for the film. January 24, 1964: Rehearsals and taping of “The Judy Garland Show,” “Episode Twenty” titled “Judy Garland in Concert” at CBS Television City, Studio 43, Hollywood. At 2 p.m. there was a rehearsal, followed by a dress rehearsal (which was taped) from 6 – 7 p.m. then the final taping from 9:30 p.m. to 11 p.m. The show aired on February 9, 1964. The TV cancellation marked the final tragedy for Judy. She never recovered. As for the show itself, it would not have lasted as just a one-hour concert. That was nice once in a while, but the tea for two segment worked, as did many of the guests. It should’ve been moved to Monday nights just after “The Lucy Show.” Sure, people might’ve went to bed after Lucy, but Judy would’ve stood a greater chance. As for comedy, they needed REAL writers to produce REAL comedy. And Jerry Van Dyke was plain awful, and should’ve NEVER survived past the first show, much less several months. “The Lone Ranger” bit is one of the painful moments ever on the show! Simply awful. Thank God for all the wonderful singing by Judy, Barbra, Lena, Dianne Carroll, Vic Damone, and Jack Jones.